For a dramatic, memorable enhancement to a garden or patio, showcase succulents in large pots. Big containers are both sculptural and eye-catching. Add succulents and you have a dynamic, ever-changing display as plants grow and seasons shift. Examples here are from my own garden and others I admire. Find more great ideas for succulents in large pots in my books, in particular Succulent Container Gardens and Designing with Succulents (2nd ed.). A nonfunctioning fountain planted with string-of-pearls and Dasylirion whipplei is at the end of an entry walkway adjacent to the front door. Big red pots planted with dasylirions add height and color contrast. The trio create a centerpiece for a rectangular bed of assorted ice plants. The pots also serve to relieve the eye in the midst of a lot of fine-textured plants. A series of knee-high pots planted with Agave ferox borders a walkway and contrasts with a coral wall. Beneath the pots, a topdressing of rocks and gravel provide texture and continuity. Large pots are an investment, but well worth it. This one, planted with Sedum burrito cuttings several years ago, is a surefire conversation piece. The homeowner sees it from inside her home and whenever she uses her patio. 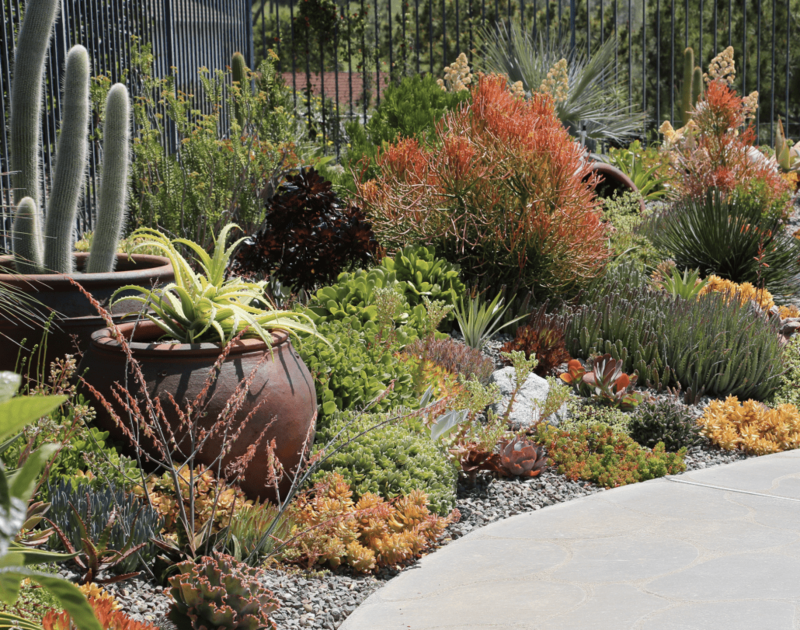 A sloped poolside planting includes succulents in large pots that stand out and add interest to a colorful assortment of succulents. Big pots needn’t be upright. This one, spilling Portulacaria afra ‘Variegata’, lends whimsy to a garden and a suggestion of motion. This is also a great way to utilize a cracked or damaged pot. Red glaze on a pot in my garden repeats the upthrusting lines of a red aloe nearby. A rectangular pot fills wall space and adds a welcoming presence at the entry to Jeanne Meadow’s garden. She planted it with aeoniums, aloes and trailing Portulacaria afra ‘Minima’. A red pot containing a variegated sansevieria makes a clean-lined statement in the side garden of a contemporary home. Rounded river rock covers bare dirt and provides contrasting texture. A pot in my garden adds height and interest to a terrace overflowing with succulents. I planted the pot with lampranthus, sedum, Othonna capensis and a variegated yucca. In a patio in downtown Carmel, CA, a large pot with overgrown Aeonium ‘Cyclops’ creates a photo op and focal point. This large unplanted pot serves as a sculptural element in Patrick Anderson’s garden. Its rounded lines contrast with spiky agaves nearby, and their orange leaf margins repeat its terra-cotta color.